Okkkkk hope I get a reply. I’m desperate. I had gallary lock f years but Monday I went to open it an there was black boxes where my pics should have been, I panicked I did what u said do an Uninstaller it reinstalled it put in 7777 an I got a new app with nothing in it. Where did it go. What Android version and Phone you’re using? I have a glh file from year ago but gallery lock does not recognize/find/recover it. I tried changing the extension and video recovery softwares but they did not work. What can I do ? I have a glh file that I have saved years ago but when I put it in my phone GAllery lock does not recover or see it. I have also tried using a video repair tool and that also did not work. What can I do ? Hi I have a glh file that I have saved years ago. But now when I put it in my phone app does not find or recover it. I tried using a video repair tool and that does not work either. How much size the glk file is? Thanks for visiting my blog n letting know the results… cheers! I have Micromax A210, I had secured folded ( Secured Gallery) I forgot the password. When you say deleted folder is it from phone internal memory/SD Card? or is it the application you deleted? Is your phone rooted? try to navigate via command line to the phone memory and see “dir” to list contents. I am hoping you are seeing the right folder and at the right path that has gallery lock contents. Try to copy the folder to your desktop and see if you can see the contents. 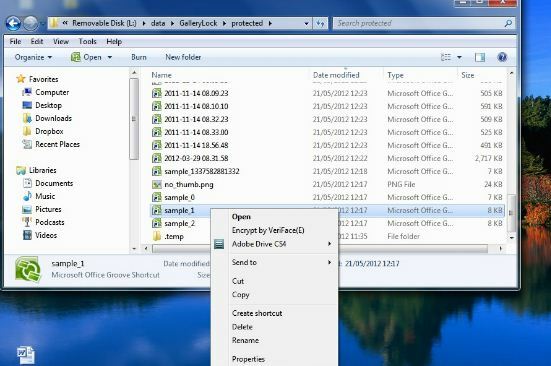 Do a dir to the folder directory from command prompt. Btw what’s the mobile ? Hi was wondering there is any way to get your pic and videos back from gallery lock when you change phones. I had the sd card in my tablet with gallery lock and it stopped working just won’t turn on so I put the card in my phone and the gallery lock on the phone can’t find them. Didn’t know what to do. please help me in retrieval of my photos. all are in .glk format and am unable to view those files. pls help me to change it to my old jpeg format. i locked a video file in my phone got deleted how can i recover it? I used to lock Lollipop data protection on my phone… please help me!! hy i have a question….i was try to less loaded my phone memory so i transfer some media ( audio songs and images ) to sd card and also deleted some empty folders from sd card .. after some time when i opend my gallery lock me images wasnot shown only the interupted folders was ther which wasnt unhide or deleted … so i reinstal the app and try to back up me data by using the option from the setting of galery lock but all in vain ….. i just want to recover my pics can you plz help me…. What is the Android Version your phone is running? I have a different question which is related to this blog. How can I permanently delete these files? Gallery Lock pro can recover some files which I actually deleted. Using the android option to delete the gallery lock’s data or uninstalling gallery lock pro didn’t help. After reinstalling the software it keeps finding the files which propably means they occupy space on my phone which I want to free. Once you delete files manually within gallery lock shld remove the files. Uninstalling application doesn’t mean data folder of this application too removed. So try deleting the contents within gallerylock app and then verify if you still see files occupying your phone space. Thank you for the info … and that’s kinda my question. Where can I find the files I need to delete? I wished Gallerylock Pro had an option not just to recover files but also to clear it’s complete content (or at least specific parts of it). I was able to delete the files, thank you for the assistance. Silly enough I found them on the extenal SD card which I coul access anytime using my PC without rooting the phone. I was just looking in the wrong location the whole time. i have deleted all the realated folders of gallery lock with all the thumbnails and encrypted files. and also uninstall gallery lock, now i want all my pics back. is there any way to restore them. Very less to no chance… Try file recovery tools like R-Studio and test your luck. I have samsung galaxy phone, I’m facing problem with recovering my pictures from the gallery lock pro. When I opened my GLP after several months, it wasn’t showing me my pics but its locked icon of 20 odd pictures that I had saved, after a lot struggle when I wasn’t able to see the pics, I read at some blog that uninstalling and reinstalling the app would solve the problem. But to my horror when reinstalled all those 20 odd (most dear pictures of mine) vanished (as in now there was not even that locked icon of the no. of images). Since then I have been trying really hard to retrieve my lost pictures, I bumped into your blog and feel hopeful that you might be able to help me! Also when I connect my phone to the mac, there is a sub folder of Images that I named “XXXX” which is the same name I had given in GLP!! But its showing empty (0 files/bytes) when copied to my mac. I don’t know if I made much sense, but if you have understood the problem, PLEASE PLEASE HELP!!!!!! What is the Android Version your phone is running. Basically you cannot see the GLP hidden contents unless your phone is rooted. So I was wondering if you are looking at the right folders? What is the Folder Location path? please use Root explorer or ES explorer and let me know the Folder path you are trying to see the contents. It is very important about the Android version your mobile is running. And GLP versions information too helps if possible to provide. Tried to add Application on Home screen from Add widgets/app menu option? Can’t you launch the application from that Downloaded thing or From Play store? I was installed hide all file app. Unfortunately I was restart my phone at this time My images are lost in Hide all file application. I want to reload that images can you please help me. First of all I am not Gallery lock developer or person who works at. I’ve started this blog to help people who are having trouble with technology; mobile, servers, and other IT stuff. However I will defnly try to help in your case too. Please tell me if your mobile is Rooted or not? Mobile Model and Android version. So are your original files removed from gallery? And are there only on Gallery Lock? sir, i am using gallery lock …my files were saved in my internal memory …it hve 1000+ images …by chance i have cleared the folder form internal memory…now whn i open dis gallery lock its showing the file name nd no. of images it have …but the images are not visible…sir plzzz plzzz help me..
mere mobail me mai ek video safe galary me dala fir mai mobail me ka all data computer pr move kara. or mobail reset kara.ab vo video muze nahi dikhai dera. If u have reset your phone to factory settings, then all data in your phone is gone. You may have to copy data from your Computer again back to mobile. My device name symphony w68_Q my account name shumi2244@gmail.com this site to download softwer gallery lock in a huse parsonal picture now this softwer gallery lock dellet to my device. Please answer me how found to my very need to my all picture. Please answer me. Do u mean u deleted application from ur phone? You can reinstall and scan for lost pictures again from application once installed. If u deleted pictures or formatted phone, then I can’t help. No way… Since formatted phone. Storage recovery tools are there, like R-Studio, but as per my knowledge they can’t retrieve your phone memory. If wish to, try scanning your phone using R-Studio Application for lost files. Hi… Cache files are just thumbnails that displays or previewed when accessing original files. If these cache files are deleted, we can rebuild them if we move back files out of application folder and then relock files. I can’t thank you enough!!!!! You literally just saved my life. I thought I lost all my pictures. So u able to recover older photos than january? i have downloaded file lock 1.1.0 in my samsung grand phone and then i locked some pictures…As i was trying to open the filre lock but i forgot the password and not able to open it…So i uninstalled the application but still pictures not opening. Please help me out to recover those pics. Hi Sachita – How you moved your images folder to your SD card? is it a copy paste or cut paste? so, are all image files weighing original file sizes? say in MBs or >100-200 KB? Missed in app lock and gallery as well? I hided a video on my android internal storage using file hide expert and i formated my my phone. If it possible to recover that file? As a last step, try r-studio to scan for lost files. Files will not be deleted. i am having android phone. I am locked some video files through I lock neo app in sd card.i lost my phone.now I want to open those files but the files are not getting open,the files showing 3gp.lck extension.when I want open in phone the files are not getting open. Have you tried copying the files to computer and rename them? i locked my photo in photo locker . in my sd card i have a folder .pl which contain images which i locked with image name followed by .jpg.pl extension. so can u suggest me how can i convert this image file or get it back. kindly reply. plz. i hide my images and videos in samsung grand 2 but now i m using samsung galaxy core so how i can find the images and videos in thios phone ? Hmm… I don’t understand your question. So you want file location in New phone or want to copy files over here to New phone? Hi i have locked all my inages in gallery lock and i do factory rest in my mobile now how can i restore my all images? Plz help me i have lost all my inages after factory rest. Factory reset erases all data. how come i cant copy and paste the protected folder? Trying from PC or within Phone? I checked and searched my phone memory for the .glk and .glh extension files but I could not find any one. I am using Clean master application and shall delete the Junk files and Boost the memory frequently. Do the gallery lock files should have been deleted through Clean master application? If deleted by clean master then how the file name alone are visible in the gallery lock folder? Clean master will not delete glk n glh files. Our deletes any tmp and cache files only… Example browser cache and tmp downloaded files. I bought my phone a year back and i had saved some photos but later on i accidentally deleted the photos from the gallery lock app as well as later on the app got uninstalled. Thanks to my weird S2 phone. It has been almost a year now and i suddenly realize that i had to send those photos to a friend who is looking for them. I dont click too many photos from my phone but have been extensively using it since that time. Maybe clicked 50-100 more photos after that day. Can anything be done now?? Actually, the reason i was worried was that I had sold my phone to some guy to whom i did not give my pass code to unlock the phone. He said that he had flashed the rom and sold it to someone else on part by part basis. He said that flashing, deleted all my data as he had to sell it to some other person whose S2 parts had to be replaced by my parts. So, i wanted to ask you whether flashing deletes the gallery lock folder as well also does it delete my other photos which were present in the gallery?? I am using Samsung Galaxy core and had Gallery lock application. I have recently changed my external memory card, so I copied all the files/folders/content from old ext memory card to new external memory card. Then I deleted all files in old external memory card. Now I could not view the picture files in the gallery lock or cannot even play the movie files. But the files name is available inside the gallery lock. Pls help me out to recover the same. Hi vivek, thats probably because newer android doesnt support write operations on ext memory card, so probably your new phone n new application dont have permissions. Uninstall secure gallery app from my android .I lost all my secured files..Is there any way to recover that software. Secure gallery app – is it the software full name? I am using ‘HI App Lock’ and I have forgotten my password and now not able to access any of the apps in my samsung galaxy android phone which are locked by this app lock. Could you please let me know any possible solution for this? Sorry, I have not worked on this app, so I have no solution for this. If I get time, I will surely look into this. Thanks for your visit. i am using gallery lock lite app. Few photos seems to be corrupted and i am not able to open and unhide it. All these are my important photos. i want that photos, can anybody please help me. Hi goutam, wen u say corrupted, what size they are n how they behave since u conclude they are corrupted? i have locked my videos in Video Locker app is it possible to recover?? Hello, let me know which step is troubling you? Please tell me that, wen u change the file extension on your pc, wat message ur getting wen u try to open the file after changes made? If this ia nt working for u then try to rename in phone itself. Try using root explorer application in ur phone. the file extension wont change , specially the .glk in the file i want to change to photo,, what should I do?.. Can you mount the phone storage onto laptop? Usb? Or anyways? Broke means, complete loss or any chance of mounting ??? hello , i am unable to change the extension from .slm to .jpeg or .jpg.it just change the file name. i am trying to do this after moving files form lock folder to other folder in my samsung mobile. It was good and useful note for recovery. it helped me well. Thank you and keep it up. i use photo locker in my htc. now photo locker donot open.how i recover my data? Wen u say do not open… Does it mean app crashing? Please provide application complete name and version ur using. Any ways, thanks for the help. You have a great time. Then i think i had lost them. My phone is formatted, this morning. Do you have any idea, If this application, people can help me getting those original data. I managed a few. But i see pictures had lost there original size and clarity. Any hing you can help with. Thanks. Hmmm… Is it completely downsized? Original files shldnt be compressed… Can u recall the original pic resolution and current? My .GLK file sizes are 5-7KB only. And once i change the format to JPG. I am not getting the original PICS. Please help. If they are 5-7KB then they are thumbnails. Your original files are hidden in system partition and can see if ur phone is rooted. Looks you have helped many. I am using Nexus 5. As per your post i tried doing some, but couldnt get through. I see the shadow of my pics, in Gallerylock\thumbnail. Please advice, what to do after that. My files extention is .GLK. Glk extension file size please? now in gallery lock i can c folders i can even c how many pics r there in the folder bt i cannot se the pic please can u help me ?? Is that you say, you cannot open the files in Gallery Lock application, but can see the thumbnails? Those tiny previews when any folder opened in there? Is that image open shows dark blank/broken view? yes it shows dark blank n broken..
Then the original files could have been deleted. If ur not rooted, you cannot access the folder specified in the post. Hi i need sone help and sorry for bad english, i have gallery and i think i moved it to sd card before and including other apps, now i removed the sd card for safe keeping incase if someone steal my phone i have the memory card, unfortunately the memory lost and um afraid someone took it, and i dont know where is saved the pics that i hide it in gallery lock, all i can see on my phone is an icon with an apps name on it without the image, when i open the gallery lock i cant see the pictures that i hide there its just an image like a corrupted icon, if its on the sd card , can they see that file? Have you moved Gallery Lock Application to SD card earlier? Or Gallery or Images? New Gallery Lock Application will hide the pictures in Phone memory, but it was hidden in system folders to protect unwanted access. Only rooted phones can access this location now. The location is mentioned in my above post, please refer if required. Any other questions, please reply, happy to help. Hi Chaladi, I am not able to view the photos in gallery lock (Lite) 4.7.5. I doubt that i am not able to view only after updating to this latest version. I tried to follow your steps in starting comments but I couldnt see any folder inside sdcard/data folder in phone memory. KIndly help on this. Hi i followed the groove extension change to .txt method and able to see the .glk files in system but not in mobile. some of the files are able to be renamed which i didnt hide but most of the files r not able to be renamed. I am checking in album_thumbnail folder as there is only 1 photo in the protected folder. Pls correct me if i am wrong. i am not abble to reopen apps lock and galary hidder after upation. plz help me. I didn’t get your question, please brief. Sorry. They are now placed in a secured root folder place, so root access is needed to see the hidden locked files. Unless u root or scan with file recovery software, files cannot be restored easily. Media files thumbnail prevew not showing in the smart gallary lock apps as many files are single folder i.e. video. Where as outside folder preview are showing. Kindly help me Bcoz I have to check play each file. I am really sorry that i couldnt figure out your exact problem from your wordings. Do u mean that in your gallery lock application you couldnt see thumbnails? Is it smart lock or gallery lock,because they are two different applications totally. In any cases, i think ur media database is corrupt n u will have to rebuild that. I think u will have to unhide all videos and re-hide again to build a fresh db for gallery lock thumbnails. Please do reboot ur phone post unhiding all ur videos and then after rebooting start hiding all… That builds a consistent db for ur files. “Folder lock-1.3.0.4″ app. I had choosen an option of calling code approximately 2months ago and i forgot that calling code, my mobile phone (Samsung Galaxy Grand 2). I need the documents inside my folder lock. Please help Us. Sorry for the delayed reply and appreciate your patience. I had select a option of calling code for hiding the Folder lock app. for my mobile phone (Samsung Galaxy Grand 2) and now I forgot the code. Please can U help me how can I retrieve my folder lock. can U post me the calling code. What’s the application? Be specific about version as well please. “Folder lock-1.3.0.4” app. I had choosen an option of calling code 3weeks ago and i forgot that calling code. Please post the calling code. I used gallery lock to hide my pictures. I cut pasted my sd card contents to my PC and now have no access to my hidden files! I tried pasting the contents back to my sd card but no help. Tried the “recover your files” option in the settings but again didn’t help. Is there any way out? When u say cut paste, is that gallery lock glk files you moved? If so do u still have glk files with you? So is that Ur trying to tell that, moving to pc, lost and then undo didn’t brought files back to gallery lock? Sorry, but you should have the files, if lost, you can use a data recovery tools to recover lost files. However that needs bit techy very slight though and bit patience. Let me know further. Thanks for Ur wonderful visit and comment Maeri. Dear i have delete my files inside of gallery lock. is it possible to recover those? Try r studio recovery tool and scan the sd card..
Hello… Can you able to see the gallery lock folder in your phone as said above? Go through the folder and let me know. Hi… Shammi, first off please don’t post your number online anywhere. That would lead to annoying calls or sms and telemarketing hassles. dear i tried it on pc it says invalid image(written on a black background). when i do so it says “unable to load” . Have u tried it on PC? hey dear i am using photolocker pro unfortunately i forget the password so i lost the access to my pictures .by reading above threads i got the folder named .PL in sd storage and the same folders which were hideen in photo locker.what should i do to get through this? Does the image shows black ? What size is glk file? I am having a .h2d extension. .how we can recover it? What application it is? And what size it is? Have you tried renaming the extension? I locked my photos and videos using gallery lock version 4.7. Now the locked files are not coming in the gallery lock. instead images with broken file are coming. I have Galaxy samasung S4, I used app lock vault application to hide my pics, I hide pics from SD card, also hide pics from my internal mobile storage. Now in Vault I am not able to see SD card hidden pics while internal storage hidden pics is visible in app lock Vault. Have u recently updated your Android os to 4.4.2? Hi… Hav u accessed the folder in phone and found any data or just accessing it via safe gallery application only. I have hide my Gallary lock icon, using App setting in Gallary Lock App inn my Android Phone. After hiding the icon, I was trying to open Galary Lock App but the App icon was not on my Android Destop. I have went to Phone Setting, and saw that Gallary Lock App is still running, but i cannot open it. HOW CAN I GET THE APPLICATION ICON BACK TO MY ANDROID PHONE DESTOP WITHOUT LOOSING MY FOLDERS WITH PICTURES AND VIDEO? Don’t worry, just uninstall and reinstall… And after installing the application just scan fir lost files in the gallery lock application settings. Don’t worry, it’s the only way… And u won’t loose Ur files. Inase u doubt loosing, just goto folder specified above from pc or via phone file explorer and copy all the glk and glh files to someother storage and give reinstalling a try. All my files are glh* I tried changing extension to mp4, wmv, avi, 3gp and nothing works any other solution to recover videos? I used mini tool power data recovery tool 6.8 to get files to show up but I’m stuck with glh files. Is there another way to recover them subliminal to glk picture files? I will check on this and will update you shortly. I used to unlock videos with name extensions change, but that seems to be not working now… Let me try out New ways to get them back working. Is there a recovery tool that works(or one you personally like) better? Thanks for prompt reply I want to also note that I tried uninstalling and reinstalling app. Have u backup brie files from data folder? plz tell me procegure for SECURE GALARRY app…..
Hi Chaladi. I’m David from Italy. Naturally, I have a problem with this app (gallery lock lite). In the phone folder, I can’t find this “Data” folder because it’s not present. What can I do? As I said, the new application will hide the data folder. As u can see from my above post that New folder is located in different location. Please see the above post saying two different locations that needs to be seen for folder. Chaladi I apologize, but I was not using a “File Manager”. Now I’m using it and I found the folder. I will try to follow your guide to the best you can. I’ll let you know. Thank you so much! No problem… Thnq for ur support. Problem solved. Thank you very much! Hi. I have the same problem as Jack, the video file is a .lck file and I can’t find a way to open it. Is there a way to open the file? How can I change the file format? and if so, which software? If .lck rename didn’t helped you, then as of now I can’t pull other ways… But for you I will work on that. Hello. I have deleted gallery lock on my android evo 3d, I have retrieved the files, but they files are in .lck format. Is there any way to view the video? Hey. Have you changed them to .avi or .mp4 extensions? I tried looking for a file converter, but none of them would take a .lck file. How can I make it an .avi or .mp4 file? Hi. Basically the pics once are hidden, they are moved to phone memory. So, even you replace sd card the pics will be still there in phone memory. So, ensure the piCS are still there in hidden folder. I will guide more in short time about that. Hi Chaladi, I have connected my Samsung S2 to my PC via miniusb. I have changed my folder options through Control Panel exactly like your screen shots but I am unable to find the Gallery Lock folder. I have looked everywhere, in both data folders on SD card and Phone but still not there. Any ideas how I can find the folder? Hi. The folder shall be hidden. Have u tried searching for the folder from phone file explorers too? Basically the new installation of gallerylock application hides the folder in direct phone memory. Please refer the locations u accessed and tell me to see if further I can help. Hi Chaladi , the only problem is that I cracked my screen, so it is not working, I can only access via usb on my pc. I am sending the phone off to insurance tomorrow so wanted to get the files off before that. Hi. Please check my prvs cmmnts. You r given some info, plz revert back with requested information. I had to thank you for this. This has been a lot of help! error is (license validation error)this is not an official purchase product.terminating service.. Since the application is not genuine, it exits. One work around is to locate files in gallerylock folder just as I said in my post and copy them to your pc or phone memory. Another workaround is to uninstall this version and install new application from playstore or 3rd party sites and go to advanced settings in application and scan for lost files. You will be good to go to do that. And btw, uninstalling application won’t delete your files in phone. It will leave them intact. New application can see the files located. dear sry to bother u, but in my files no showing any gallery lock folder…what can i do???now. Hi please use root explorer and see theres a hidden files gallerylock as I said in post, In sdcard you go to data folder and then .gallerylock folder and then protected folderw. Cheers! Still doubt, don’t hesitate. Please follow the steps and let me know what exact problem you having. Please install Root explorer application from App store and follow the steps I mentioned. If still cannot see the files location. I can say that you must be doing something wrong at some point and I highly recommend you to pay attention to every step you do, cos there shall be files and folders. and BTW, please do not post your numbers here, cos Marketing guys will trouble you and for safety purposes too. mere sd card me kuch .slm aur .slt file hai jo open nh ho rhe hai plz tell me ki mai ise kaise open karu…ye image file hai plz sir tell me its an very imp. First off, please follow the instructions precisely. Try the both methods, my solution and users stating solutions. Tell me if then you have no solution. photos are opned very smaller size.. I have followed the guide and was able to locate the gallery lock folder and all the other folders under it (using pc). The problem i am facing is that i am not able to view any files under the folder. It says there are no items in the folder. Can you please help ? 2) The phone display is spoilt so i cannot access my phone’s data in any way other than connecting to pc using usb cable. Not .gallerylock in sdcard root location. I uninstalled Video Lock application (NEO) in my micromax A65 mobile before unlock the (.lck) video files. Now i can Not open the .lck format file and tried to reinstalled the application no lock and also rename .lck to .mp4 video was not opened. Can you pl help and recover the video file. Mail ID jafar.s87@gamil.com. Pl send the details to mail. Pls help required due to my best photo in this folder …. I am sorry but I am unable to understand your question. Maybe I am not able to get a good understanding of your problem. Can you please tell me what exact problem you are facing? So, is that Application telling that you are missing .pl file to start the Application? Actually the locked in Photo Locker application… then I will try for application for further activity but the Application not opened, one error on display…The .PL file missing. Pls help for the same. Before that can you tell me the exact Application name . Hi, have u tried reinstalling the application. Please do it and let me know. Your question confuses me… Sorry about that. But extension is not something that I can Email you. It’s the Renaming process, where you normally rename the File with the desired extension name. For example if my Music file has Awesome.mp3 as it’s name which would normally open with Windows Media player, Now I will change the .mp3 to .3gp or custom extension, where I have set some applications to explicitly open such Files for me, for example I have now set VLC to play all my .3gp files. If this is not the answer, what you are looking after I am sorry. Please state clearly what you are looking for. change the overall look of the battery, fonts and backgrounds. I didn’t get any hidden pictures on the new phone, When i open gallery lock pro it ask me for password and it was not the same password that i setup on my old phone. It is the default password. So it think it is just a new installation. Now i wanted to know how do i get the hidden pictures back from my old phone. So… That’s all I wanted to know. For that, go to said location in the above post using root explorer and copy the protected folder to ur new s4 sdcard and then goto settings and use advanced settings to scan for lost files. The location is /sdcard/data/.gallerylock see the (dot) it’s hidden now… And then copy all the protected folder contents or the folder itself and paste on desktop or sdcard where you will put new sdcard into phone. I am using the same memory card from the old phone. And the location that you mention i don’t see any .galleryfolder. Do you want me to check the same folder in the old phone as well. Where do gallery lock pro saves data phone or memory card? Hi since u were using same sdcard, try search for lost files option in advanced settings of gallerylock application. I did that already but no luck. It say no files are restored. That’s because… Ur files are left in phone memory… Go to phone and since screen isn’t working, connect usb to pc and goto sdcard data and then gallerylock and see there or else said location as above. In the old phone i can the location data\GalleryLock and then 4 different folders inside it, but all the folders are empty. Do you want me to check in the SDCard or the old phone? Also check .gallerylock location as I said in previous comment. Newer version of gallerylock hides the folder with dot placed before. And ensure that u selected show hidden files options… In file explorer settings. There is no .GalleryLock folder in my phone. The only folder that i see is GalleryLock and all the folders inside that are empty. Is there another directory where we can check or can we do something else to recover those photos. .gallerylock shall be at the mentioned place, else means u have used older version on s2 until now and we can do nothing if protected folder doesn’t contain any images. Sir I tried the method u showed but its applicable nly for .slt files…but when used for .slt files iy shows image invalid…plz olz plz help with this.. Sorry ur question has some confusing sentences. Slt and slt again? Slm? If so, please confirm if u have followed the updated techniques on it? Please see the comments, which says some are identified as solutions. I changed the file extension to jpeg…..yet the file not recovered……it is showing that as invalid image……PLz help me ………………. Hi is it glk extension or slm extension? If u cannot able to recover using my mentioned methods in this blog: that there’s another post on slm files in this blog site. Search for slm in search box. So, if my slm recovery is of not working for you, then I recommend lend a phone of ur friend and copy the slm files to location as said in slm post and recover easily from there. I am getting some images in .sfm format how to open them or recover them..? Lost 100 images in safe gallery lock showing image name but no thumbnails. Your help is really appreciable. Very important pics of my life. Hi safe gallery files are stored in .thumbnails in DCIM folder in ur phone memory. As said by one if the blog visitors. Please check there with root explorer file manager to see if that info can help you. I tried like you said i changed the .glk to notepad and it only applied to videos .glk.I changed them to .mp4 and it works but not for the photos the haven’t any extension like the videos.Can you help me out? Hi, so, if extension doesn’t work for you, Try renaming back to .glk as originally and place them all in one folder in sd card and then now scan for lost files from gallerylock application. Earlier my safe gallery Lock was working perfectly on my mobile. All locked pics/videos were showing up perfectly in safe gallery lock app. But few days ago, I recieved notification to update Safe Gallery Lock app on my Samsung Note2. When the updation was complete, folders are showing up but the locked pics/videos inside it are not opening. ‘Not Found’ error is on the thumbnails. Could you please provide steps in order to fix this issue? FYI – I haven’t tried uninstalling it. I highly appreciate your immediate response on this. Have U tried the Scan for Lost files Feature yet in the Application settings itself? If not try, if tried I would highly recommend that you install Root Explorer File Manager and See the Application Data at the specified DATA Folder in INternal SD Card. You will be Shown the Actual files, if at all they were Locked but not been visible in Smart LOck App. If cannot find the files Please Reinstall and, I hope that will work for you. But if you find the Files from ROot Explorer, then I would recommend you to Copy the files into External SD card and then rescan for lost files, if doesn’t work, try re-installing the app. Thanks for your prompt reply and I appreciate it. Now regarding the issue, Whenever I try ‘Recovering Locked media’ -> ‘Quick Recovery’ or even ‘Detail Recovery’ option, I get ‘There is no locked media files not to register’ popup. I wasn’t able to exactly find Root Explorer File manager but when I installed other explorer like ‘ES File Explorer’, there was no files in DATA folder. Could you please check again and let me know how I can proceed now? Nope. Root manager allows you to see the other hidden directories with read permissions as mounted if the device is not rooted. If rooted, it mounts the filesystem as read write access permissions. So, I would recommend that root explorer. If still confused, I will tell you exact navigation instructions tomorrow. FYI – I am not very much in the favor of Uninstalling the app, because it might delete my pics/videos altogether. So, better to wait for your guidance. I haven’t heard anything from your side. So, could you please let me know how to proceed now? 1 – The application exact name and version. 2- Have u tried root explorer yet? Alright, With this information Handy, proceeding further left us with the only option to Uninstall. The SAfe Gallery itself explains this best way. And for Trust, the Gallery Lock Application that is More popular than SAfe Gallery does retains all the Media files even after uninstallation. See the TIPS section in Yellow. If you are hesitant to do that, then I am sorry that I cannot see any other ways around to hack the Folders or DB, cause Yesterday I tried to get into tweaking, but the codes are hashed and Compressed the files elsewhere with the Naming convention altered. Sorry. Cheers! and THanks for trusting on me for a solution, but sorry I may havent met your expectations. Just for everyone’s information, I found files in DCIM –> .thumbnails folder using File Manager app. The folder conatined thumbnails for all the pics/videos in my mobile (hidden/un-hidden) but it worked for me. I just copied the files on the external card and then uninstalled the app. I am now using Gallery Lock (lite) app from now onwards. That sounds great. But does that thumbnails sizes original files? I mean recovery if original files are done? Yes! thumbnail sizes were the original ones…. Good, but basically, thumbnails are as they say preview pictures of all media files. They can be game images thumbnails. Anyways glad u recovered ur lost files. Did u managed to see .gallerylock folder in data folder and then protected folder in it…? You can use root explorer software to navigate to the said directory. Yes it was factory reset! but those all files are on computer any way issue is that they show 0 kb why is that?? I tried scanning files but it doesn’t find any thing in gallery lock I am not sure how to scan phone using r-studio? Do you think it is better than scanning please tell how to do this if it is any better? First off use Pixrecovery software to recover those corrupted 0 KB files. If they cannot be recovered or recognized, then R-studio is the only option. I would say try the software; where u spend nothing on it for trialwares… Or … U know where u get full versions too. If so, try R-studio application to scan ur phone from pc and see if that can help. If that can’t, i am sorry to say that u just lost ur files. Alternatively first try installing gallerylock app again and scan for Platt files from advanced settings menu within gallerylock app. What if i uninstall the gallery aps? What would happen to my files bro? BRO HAD U GOT ANY SOLUTION FOR MY NOKIA 2730 CLASSIC????????? Sorry, As of now I personally Not able to implement any Tricks that could do the needful. I am seeing on net the different ways to crack password, but you were not interested with those; I am imagining such like. But, I can think of a solution like Using Data recovery Softwares like R-Studio, who are really capable of retrieving data. However that’s a coin flipped case again. If you are not able to get to work with any of the tricks mentioned over the internet, then I am sorry that I cannot give you a tailored trick that works for you, cos I am not practically done with the recovery process. However, If interested please do try the R-Studio Software trick, which is capable in doing thing; hopefully. Sorry for such a delayed reply and disappointing you with my answer. thanks for ur suggestion i will try once. thanku so much once again. erm, i get the file.. but got 2 same name.. how to solve it~ after i change to jpg the picture so small or can’t open..
2 files showing are: 1 original pic and 2nd one is thumbnail of it. Thumbnail usually sizes very less and original pertains original image size. You have to look at sizes and copy them only. Different case? Let me know. my nokia 2730classic memory card is locked with password. i tried a lot bt cnt remember my password…. kindly help me to get bck my data saved in my memory card. i even tried Fexplorer for java bt in the c:/ i cnt find system folder in that . Sorry for the delay… Will look into this. Sorry. Will try to help you in this. Now install gallery lock again and scan for lost files from the advanced settings in the gallery lock. Have u done the above steps already? If so, and still not suceeded; you should now use file explorer to get into data folder and then gallerylock application that is hidden with period (.) Used for hiding files. hi..i have hidden this app from setting now i cant start this app bcoz its hidden now what i do? Which folder you are accessing? .gallerylock or without . (Dot): dot means hidden folder! hey pls help me to unlock my memory card of nokia 2700c ..its really worthful to unlock dt..do suggest me something asap.. i will be grateful to you for the same. Help unlock your memory card means? What to do with the problem? Please let me know the exact problem… So that may be I can help you out. the problem is my nokia 2730classic memory card is locked with password. plsss help me with any kind of software or any help. Hello , I have a Samsung galaxy s 3 and I frogot my password and I really need it I have all my pictures in there since my sister passed away on 05/18/13 I have nice pictures w her and I really want this files.please help me do you guy send like reset password and send it to email or what ,??? Yes… Lot of them did that including me. I just found out that it needs to be rooted, can I root my device, restore my files and then unroot my device again (Galaxy note 10.1)?Do u have a safe procedure for this? That’s quite a good solutions… Kudos! U r great man thanks a lotttt…..
Hello Clarence… Look, first off you should follow the exact procedures as I said in my above post to recover the videos from gallery lock extension. If you try to change something with extension kept intact, it’s of no use. First remove all extensions of videos and assign them avi or mpeg that a good Video players like VLC could be able to load the video codecs into it. Second thing! If it’s of hard to me, I am going to tell it straight away. The whole recovery process has been identified by myself and I tested everything and blogged it, not just blindly. If this process is not helping you, it might be of different case in your case, in such cases Being not able to see your problem physically cannot lead me to a solution. It’s your duty to narrow down the issues based on problems and keep trying different scenarios. Well, if it’s not helping you much, I am sorry that I can only convey sorry but not any over reacting Dialogues for you. Whatever! It’s clearly stating that File extension is not compatible or not known, that shall be done with the extension itself, now think of it. I’ve already said the solution for it. look into it, if interested with patience. How do i rescue my pics if from smart gallery lock if i hv lost my phone? Or if you stored files in cloud like DropBox or Google Drive, then rescued. Please note that you normally save your files in your phone only, so how can you recover files alone, not being your phone recovered first from theft. Not working meant? Cant access smart lock app? Recovered files but videos won’t show. Ive download apps to try to make them play, but nothing help. ……. If not, tell me wat files u recovered and what files u trying to open with the applications downloaded? Cheers! Sorry for the delayed responses. I recovered images and video files. I can see the photos but the videos won’t show up on my phone. Ah I see thanks for the help I’d rather not try to void any warranty I have since I will be sending it to Samsung in the near future. Thanks for putting up such a great guide, but I have a problem. I have gallery lock on my phone, not the pro version and I happened to drop my phone and now the screen stays black and the touch screen doesn’t work. So I will be in the process of sending my phone out to Samsung but I believe when they are through with it, everything will be wiped. I hoped to save these pictures before I send my phone off. After hooking up my phone to my laptop and navigating to the gallery lock folder, everything in that folder is empty. I checked off the option to show all hidden files and folders but the folders are still empty. Is it possible for me to retrieve these pictures before I send my device off or does my device need to be rooted to access these directories and potentially voiding my warranty? The new gallery lock application stores the files in different location than previous. You have to look at the gallery lock folder that is created with . (dot) in the front. Check the show system files options… If using PC… Make sure the . hidden files too are shown. After going through all the folder I am only able to find one (the same one as before)Gallery Lock folder and this one has a file size of 0 bytes. Unfortunately I do not see folder labeled .Gallery Lock. I went to tools > folder options > view tab> and made sure that show hidden folders and files were checked off. Also where would the show system files option be, and does my device need to be rooted? Yes to be able to see system files, your device has to be rooted. Sorry abt that..
First off Unhide the pics from Gallery Lock, if you can access the App. If you are not able to see the Pics hidden in the Gallery Lock APP, then even if you uninstall the app, you will not lose the files those were hidden with the Gallery Lock App. You can safely back them up using reinstallation of App in the later times. However, since you were finding it hard using the app, i would recommend some other Apps to do the things for you. There are lot of other Apps which do the job almost same and nicely. One day i went to my gallery lock app not the pro the regular. and my albums were there but the pics were gone they wouldnt load up or anything what do i do please help me ?????!!!!! PLEASE i have important pictures in there that i need. So, albums were there but not images in the album folders right? Congratulations on getting the things back to work. Thanks for visiting my blog and thanks for your wonderful questions, comments. And more importantly thanks for your patience. Cheers! You can always contact me here in WP for any queries. I will definitely be at your help. One day i went to my gallery lock app not the pro the regular. and my albums were there but the pics were gone they wouldnt load up or anything what do i do please help me 😦 ?????!!!!! PLEASE i have important pictures in there that i need. how to use advance settings? The advanced settings is visible in Gallery Lock Application. Go to Settings In the Gallery Lock Menu and Then In there You see Advanced Settings. From there in Advanced settings, select Search and Recover Lost files… Settings. THere it will recover all files named with glk extension in the hidden folders and will saved to jpg or for videos avi or mpg as app decides and will save them in Recovered folder and then automatically appears in your Gallery. Note this time it shows in gallery, not gallery lock. i have hidden my files using this app and implemented more security by hiding safe gallery lock from settings. which give me a number #789 (dial) to view this app icon and then provide specified to view locked files. i have changed the number #789 to my own wish. but now got a very critical problem, i forgot this number. now i could not open safe gallery even i could not view safe gallery icon. i have tried many time but could not resolve this issue. i have tried to uninstall this app to recover my files but the uninstall icon is also disabled. please help me to resolve this issue. I am looking into this issue right now. Please allow me some time to get an apt solution for you. Thank you very much for your kind support in this regard. Update: still finding ways to resolve the case. can you tell me if we uninstall the safe gallery then can we recover data? because i have found a way to uninstall it, but i do not know about the data recovery in case of uninstall. way to uninstall: -> go to settings –> security –> Device administrators –> (safe gallery free check box will be checked there, i marked it un-check and my safe gallery uninstall but enabled). so now i can uninstall it, but i need my data,, now further you may suggest me the way. I have uninstalled the App using System APP remover, and then INstalled again the application from Market. And Luckily the recover options in the Application works flawlessly. Now go a head and do as You thought to do with good faith. Hi, you can use advanced settings and scan for lost files. That way u recover all lost files. Bro.ur idea worked fr me..n i hv got al my videos bk.. thanks in a ton…really u r awsome..u made my day.. Thanks and glad my solution worked for you. here’s i got a problem, i have a .glh file which is a video file and i tried to change it into .mp4 or .avi but it doesn’t playing like usual on my computer? what can you say about this? Do you have any solution? Please chaladi help me idk what to do but this file is very meaningful to me….. 😦 plz reply ASAP. Oh! Dear… can’t play with vlc player? Or any other players in desktop? Getting error like what? Can’t play or unknown format? If you did all and still no vain… try good video converter software to detect the video in its loaded playlist to convert and try converting the same. Example of good video converters: Xilisoft Video Converter.. search Google and download. Get back to me if problem isolates or still persists. i forgot to ask! do you know what software can be used to convert .glh files into many type of video files? unfortunately, after i changed the .glh into .mp4, its media information is gone but the size is presented… what can u say about this? Converters like xilisoft video converter, TVC; Total Video COnverter are good at converting. Try them and let me know. THey cant recognise the glh file extensions, please rename to avi or mp4 or mpeg or any video extension until the software recognises it. i have doing it Chaladi using TVC and Xillsoft converter but still it cant be opened 😦 have u experimented your .glh files? I retrieved my .glh through the recovery software. I found the way… Renamed the file with extention with. glk and put it back in protected folder then did a recovering again and got my video files back…. That’s great… But i am not getting how cant you play videos in PC. Do you have SLM and SLT files handy? I mean do u have them in SD card with accessible… or have they gone with factory restore. Have u tried above pixrecover software? Hey hi buddy… me using samsung galaxy note mobile..n to hide video files i ws using safe gallery app..bt 4 days bk nly i hv updated my android frm ics to jelly bean..n aftr tht whn i opend safe gallery n select video to play tho it ws saying video file not found..aftr trying lot in frustation i did smthng wrong wit password too..nw m unable to open also..all files i can see in external sd wit slv format…tho cn u help me out..hw to open those files..wl b vry mch thankful…pls do help bro..wit proper solution..
Hi can you able to rename the file with avi or MPEG extension and tried playing in desktop? If you have files stuck in phone … then try copying the folder using some root explorer file manager..
Gve me more info and exact problem with the steps you already tried and not succeeded so that we don’t have to hang on same branch again..
Hi, i have a samsung ace duos and had gallery lock in that. defalt loc was sd card.. my phone was locked due to some reason and i need to update the software from the center. it deleted all the pics in gallery lock. i am having all of them in glk extension in protected folder in gallery lock. Please suggest how can in recover all the pictures. Are you having Protected Gallery lock folder in a safe place: mean in SD card or PC? If you have extracted the folder as I said in the above post, then you just need to rename glk extension files to jpeg extension. 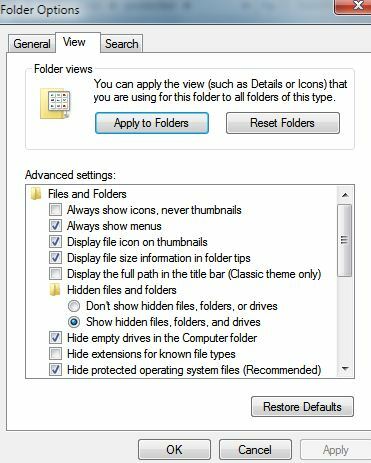 To be able to see the extensions in windows please enable extension view option in folder options: please see above post on how to do this with screenshots. If you are talking about , how to recover files from phone protected folder, then please let me know whether you have rooted your phone or had any file explorers installed on ur phone… so that we can try to get into gallery lock folder. Please read my above steps once agaun and my above post too for precise information needs and for further actions we need to take in case the above post doesn’t help us. I installed gallery lock and smart lock both on my samsung ace…and uninstalled it after unlocking my files.. the prob is the sd card is not getting detected in any phone now.. I cant view any files in it? What to do? So, does that mean, you recovered locked files, and then uninstalled Smart lock and Gallery Lock applications, and all of sudden, your SD card is not being detected! So, now from these statements, I cannot conclude or blame applications. Have u tried Accessing the SD card from PC comfort? putting SD card in some card reader or like that? If you can access SD card from Computer, Try to backup all the SD card at once, and format it, and then paste the files as required from backup made. Backup is as simple as Copying all the Contents in Drive, and pasting it into some folder created in PC. Please revert back to me if still problem persists or need further guidance. Then you have to use R-Studio or someother file recovery tools, to see if they can help you recover files in damaged Sd card and format it after. hey i hv a samsung galexy ace and had the galery lock app..i had to change the sd card and use a new one so i changed..i uninstalled the app and installed it again on my phone.nw when i put my earlier sd card the galery lock folder does not open.on the pc that folder does not open saying that file type is not suported..is there a way to recover the folder ?? This is no way to recover a file process. i am sorry, ur raw data file is too confusing to understand. Please state clearly, whether the files is locked with what app exactly. Uninstallation may removed the Folder… So in such ways, i am sorry. But you can see if the folders been deleted from the given folder location in this post. Please confirm yourself from file explorer navigation. tried that… but the video doesnt play, maybe the files are damaged, any cure for that? all of them are big file sizes. I got a few glh files, they are big in size so i think they arent damaged. they are video files that were hidden in gallarey lock but got deleted, i found the .glh files, can i still recover these files? i recovered the glk files thanks to ur help, let me know if u can help me out with the glk files. thanks. Hi… glk or glh files are to be recovered? I think, glh files can be restored using extension change to mp4 or avi extensions. Let me know if that doesnt work for you! 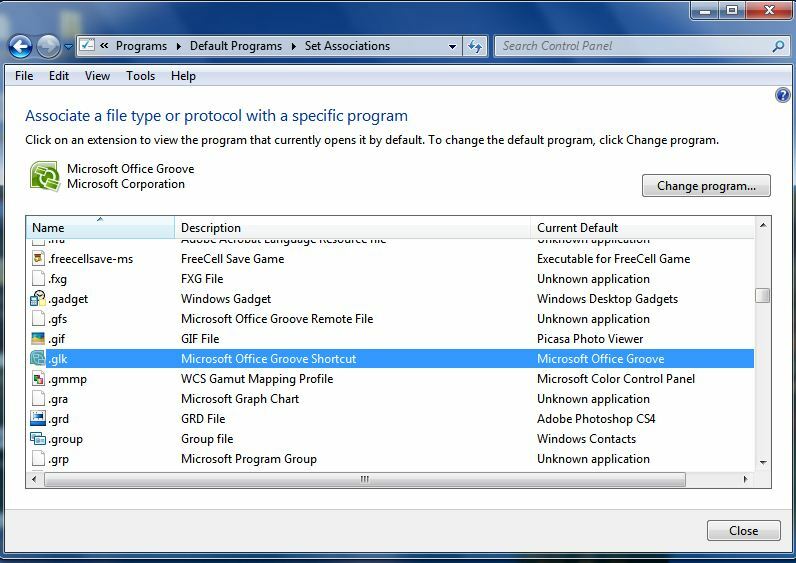 The Protected Folder, just as said in the above post guides you how to access the location. Hidden means, does the files are not showing up in Protected folder; means you can access folder but not files within? if so, try using Root file explorer or some other root capable or good file manager to see the contents. My self faced issues seeing Files in Protected folder of Gallery lock with ES File explorer and I switched to Root Explorer to see the contents. Please patiently follow the above post to see the folders. 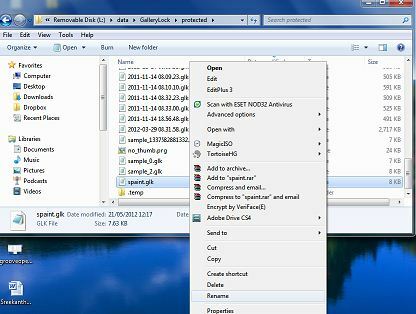 The Gallery lock folders can be able to view without any Rooting requirements. So, use root explorer or others to view contents. Try to follow every step mentioned in the above post. or, if some other issues are there, please mention them clearly. Please read this comment very carefully and not skipping single word. First off, if gallery lock is uninstalled, can u able to see Gallery lock protected folder in phone’s internal sdcard? See above post guiding you to access gallery lock media hidden content with folder navigation and path. If u can’t access or there isn’t gallery lock folder, then chances are that u deleted hidden files too along with gallery lock application. In such cases reinstalling Gallery lock application with same version doesn’t help you: you can get the same desired version from Google search results: type gallery lock apk and version number in Google search and download the apk to install. However as said that doesn’t solve problem if media folder is deleted. One way retrieving deleted files is to use r-studio application on windows and use phone’s SD card to scan for lost /deleted images. This is the only way to get content as of now. my problem is same as pankaj..
i also used gallery lock n now uninstalled it..
but here us the folder of its locked files..
but all the files are in slm, slv n slt extentions..
help me n reply soon plzzzz…. sorry for not being able to help right now… but I see most of the users have slt and slm file associations, which i have not faced yet… But I request someone like you, who can be able to send me slt and slm files via some File sharing site links, where I will look at the files and will try to foresee, if I can help retrieve from file manipulations. I request someone; maybe if you donot hesitate to help me by sending some locked files along with all relying files, like slt, slm which has same name for it. If your files are sensitive, please try locking some new share possible file content and send me across through Mediafire Links, so that i will take a look at it and will try my best soon to bring new solution for this much demanding Problem. you know i hide some videos n i got them in .slv extension files..
i just rename it to its video format and i got them back!! plz help me to recover my .slm extensions files soon!! As i said, I can only able to help about SLM files, if i have such file with me, I tried personally to get slm from new gallery lock application, however I am getting GLK extensions only. To experiment and able to retrieve original data from SLM files, I need SLM and SLT files, where I can do some tricks on them and will find out, if the tricks applied will help recover from such acts. Please understand this point and look forward in this blog. Sorry for the delayed response… If your Data folder, Protected folder I mean, doesnt have glk or slt and slm files, then, please check with another File Manager; like Root explorer except ES File explorer, because ES file explorer is having issues sometimes seeing the files and data through. So i recommend to use another file explorer. get back to me after using alternate file explorers. I got a little problem. I was able to find my missing gallery lock files bit when I rename them to jpeg they come out tiny and some are cut off. How do I get to have the full picture just how it looked when I took it or was sent to me? I tried that and they still come out cut off one some. Like the face will be cut off or the lower part of the pic is cut off. Idk why. Weird. .slt is thumb..its open..but unable to open .slm,image size is for around 2MB to 4 MB. pl. suggest if u have any way to open ….change extension does not work. still my files not recoverd yar..what to do that i doent know now…?? Still not recovered means? have u found glk files in said data folder location? or cannot access folder? Please state clearly, what have u done to recover files; like accessing data folder or renaming glk file extensions. God bless you! You are awesome! I had been trying all these programs like CardRecovery, and almost considered purchasing the registration key, but you saved me at last minute! I loved that this is quick easy and free! Thank you thank you thank you 🙂 I cannot thank you enough sir!!!! THANK YOU! hi, i have a gallery lock on my phone and there are some pictures and videos on it. now m y phone screen has broken. 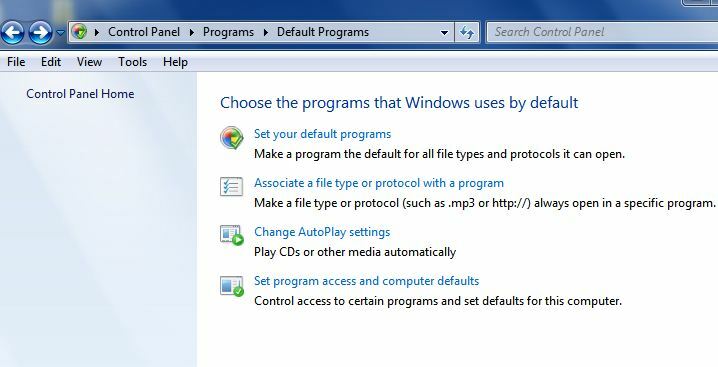 now i connect it to my pc and want to copy them on my pc and give the phone for repair.how can i do that? Hi Charan, is your phone rooted? Good day Sir, Im a samsung galaxy s2 user and using Gallery Lock Application. 2 mnths ago gallery lock application unfortunately promted me error message and my hidden photos or lock photos can no longer be accessed ( some photos cant be viewed and some photos can) due to frustration i tried unistalling this appication and reinstall it again but it doesnt work anymore. Now im still hoping to recover the photos thou i have already delted the folder containing the datas or the subfolders of this application. Just install r-studio on your PC and scan for deleted files for your phone memory. I believe it should work at times like good luck. There’s no other simple ways to retrieve deleted photos as you have specifically deleted hidden folder. Hi Chaladi, i will defintly try this soon. thank you so much. btw is this a freeware? this r studio is forphone memory only? Or can be also use for micro Sds? Thanks! Oh! Sorry to hear that… did you deleted recovery folder from gallery? If so… I am sorry I cannot help you in that… The hidden files are recovered and given to you, but unfortunately you have deleted original files and there’s no other way around to recover deleted files, since hidden files are now reverted back as recovered files in gallery..
i am using HTC one x, and had some problem with my phone. I wanted to factory reset and got my contacts , msgs back up! Forgot to back up my from gallery lock. Is it possible to recover the pics? Try re-scanning your Gallery Lock Application for Recovery Files. You can check this settings from Gallery Lock Application Settings. In err, I thought your comment as You have already formatted your phone, for which my Previous comment doesn’t apt a solution for your question. Hi, i tried and it dint have anything in the gallery lock folder (protected) also, so i think i lost my images? just for curiosity i wanna ask u , will any of the recovery tools can help? Try them (recovery tools: r-studio for example) you loose nothing right?! i have downloaded R studio, but it is not recognizing my HTC one x when i connect with wire using USB port. What sud i do? Check the below screenshot URL, it is my Image from R-Studio of my Samsung SII. It means you are not connecting your phone properly. try different computer or different cable or different ways; means use USB debugging and try many times possible. It will work, and is known for it. If still doesn’t work for you, I am sorry I cannot help in enabling you to see the device in R-Studio, as no one can help you in that. I forget to mention one thing that before formatting my phone i had made a backup on my computer and the file is in .nbu format.can i recover my hidden filles from that backup file. So, That mean, You have a Full backup of ur smartphone using Kies, that has to be restored only VIa Kies… You can sync Media FIles, Contacts and messages via Kies specifically, but you have no option to specify the FOlder that has Gallery Lock Files; which Cannot be restored. One Option I can see here is, Restore your phone completely and Check if u have gallery lock folders restored too, by navigating to Specified Gallery Lock Folder location; mentioned in My Gallery Lock recovery Blog Post. If you are comfortable doing so, or have chances restoring The Data folder of Gallery Lock from Kies backup, then only We can restore Gallery Lock files, else In Big trouble. Let’s see how this can help you sort your issue. and the name of the filles in hires-image-cache folder are CACHE File. nw wt to do? Hi… the gallery lock files are stored in sdcard/ I mean internal memory of phone. If yours android is ginger bread or ice cream sandwich then sdcard is the folder location… where external_SD is external memory card. Hello, the protected folder .glk files are the files u hidden.. change the .glk extension to .jpeg or .PNG as I clearly stated in my above post. And the three glk are the hidden files u shld copy to new location.follow my post above to recover now. But these are only six files GLK files while i had hidden more than 300 snaps and 10 videos. I had reinstalled the gallery lock app and there was a option in the app to restore the hidden files and using this i had recovered my hidden snaps bt the hidden videos were not found.why?is there any other way to find the hidden videos. No… restore option does restore pics and videos to recovered folded in sdcard0 location… which in turn appears in gallery as recovered folder with all those missing files. If u were not able to recover video files only, then hide something again: video and rescan in gallery lock. Let’s see how it can help. There’s no other ways to restore videos only in gallery lock app. i was using gallery lock pro on my galaxy s advance nw i got my phone formatted and reinstalled the app bt the hidden files are missing from my phone..wt to do???? If you are sure of not formatting the gallery lock folder… then I may tell you to do a rescan from gallery lock and if its done already and no gain from it… can you reach gallery lock folder location? From file explorer or from computer? If yes , then check the hidden files there; which can be done by following my above instructions… on gallery lock recovery post. I changed the groove files opening as notepad in my windows XP. But cant see the extention even if the “hide known files extention is unchekd…!! Sad that you werent able to see the extensions… Why not try changing the extension to use another application something like word document application or some other and Try seeing the extensions for glk… Are u able to see the other file extensions? if yes, then do the above said process… From the error code u said, I imagine that groove is still allowed to be glk extension owner, but permission errors that causing it to invoke Groove Application launch. After restoration i am unable to find any folder named sd card in phone memory mine phone is running gingerbread nw wt to do dear? Hello Baljinder, if you are not able to find sdcard folder, try searching for GalleryLock Folder from the search options in File explorer, Try ES File explorer, or Root Explorer, or your favorite, but make sure the search results yields Gallery Lock folder. Wish you good luck with that. nw wt to do dear? go to reistall ii from setting u can recover the lost files…. Forgot password and security question to gallery lock free in htc one x. Is there any thing I can do to reset password, get the password or security answer? Hey I too have SLM Files and SLT files .. I Can Only Open SLT Files by renaming ? Tell me what should i do to open large SLM file s ? hey i hav changd my mobil bt forgt to unlock my oicz…bt to recover tht ..i hav doz SLM n SLT files in pendrive. i have been using smart lock for locking my photos. I changed my sd card and copied the smart lock folder in the new sd card but am unable to recover the files.., the files are .SLM and .SLT format..please help..how do i recover it any other way???? Have U Done Recover Lost Files/Scan for Missing Files from the settings Menu? if yes, Have U able to see the Data/Protected folder of Gallery Lock from your File Explorers? I am sorry, I seriously do not understand your problem. Did you copied the files from Phone to PC or PC to Phone? Locked in Gallery Lock Application? If Not rooted your phone, Do you need to recover files, or already copied them to PC, or What is situation with FILES? Please clarify the situation. And please read the comments above, as all are of different queries came in, and might help you understand your problem and solution too in concise way. Many thanks for visiting blog, and inquiring. If it is smart lock neo… Sorry I cannot help you. Hello Sridhar, please tell me if you still have slm files with you or at the location specified as above post. hello i installed safe gallery free from google play store .due to problem in my phone i reset my phone .after that safe gallery free also uninstalled .. in this i lost all my lock pic which is very important plz help me to recover..plz plz..
Hi there, when hiding my pictures and videos, they are being stored on the data folder on the phone’s internal memory and not on my external SD card ! I’m on Android 5.1.1, on Samsung A8. Any way you can help me ? Thanks a million. Starting from 4.2 /1 android versions Google restricted 3rd party apps write capabilities to internal memory only. So this is expected? Is your phone rooted or willing to root? I can only view the thumbnail versions for Gallery Lock Free. Is there anyway to say the bigger ones? My computer says file not supported etc. Thanks! If u have done the said and still.cannot solve the unknown filetype error… try using phone File explorer method , which shld work.defntly. copy all.the protected folder contents to new location from phone and rename the glk extension.manually to jpg or jpeg and rescan for.gallery media. I’ve tried both, but I still only can retrieve the thumbnail versions. Besides, I only have .SLM and .SLT extension names. I don’t get the .glk extension. Does this make a difference? When I change the .SLT extension to .jpg it works, while the other doesn’t. Although the .SLT extension only shows a small picture which would usually be the thumbnail. What’s the Size of the Files? for SLT and SLM, are they holding in Very Less Bytes Capacity> if So, the Chances are They are thumbnails of the Media only. And As I can see, SLM is Media File and SLT is Thumbnail, Definitely, as each represent M for Media and T for Thumbnail. So You can only Thumbnails from SLT. You have to look for SLM files only in this Cases. In most people Cases, GLK extension stands for Image Files and GLH extension Stands for Video Files. So Look around carefully and play around until Media Files are Found. What is the size of encrypted media/video files? appreciate your efforts! you are awesome! but, I’m having a problem with that same .slt and .slm issues. can you plz somehow tell me any way to restore the files from .slt and .slm format? its pretty clear that, in this thread there are persons with two types of “gallery lock” user. one kind of gallery lock app keeps the files in .glk format, while the other one in .slm/.slt format. you’ve given a wonderful solution to the .glk format problem, but what about the other one? I tried but when .slt files are renamed to .jpg, they are tiny in size, and when .slm files are renamed, they can not be opened at all! plz plz plz! help! Accept my apologies for the delay… however I am not able to identify this kind of SLM and SLT file type savings with gallery lock app. I tried several versions and all are in glk extension savings only. Please let me know where exact location this SLM and SLT are noticed and sizes… since I’ve not seen this kind of cases yet, provide me further details precisely ..
SLM solution is here in my blog… check it! Forgot password and security question to gallery lock free version 3.1 on Verizon galaxy tablet. Is there any thing I can do to reset password, get the password or security answer? Hey! Yes you can recover security password and recovery answer easily by opening the preferences file of gallery lock. Go to this location /data/data/com.Morrison.gallerylock/shared_prefs/ and find the com.Morrison.gallery lock.preferences.XML file and open up that file and you will see the password and security recovery answer in that file. Many thanks for visiting my blog and without any hesitations and querying in hope of receiving answer from me. Hello Pankaj, Are U speaking about Smart Lock Application or Gallery Lock Application? Gallery Lock has .glk Extensions whereas Smart Lock has .slm and .slt Extensions. Please update me with more precise information. I will try to help you. 80 images might have corrupted. I am not sure there’s a way we can recover those 80 now after android upgrade and New application db also updated. You are Very Welcome. Apologies for the much delayed response. I had applied quick running dt is d app isnt available in d menu.We nid 2 dial #0000 fr running it.But it isnt available nw.Wat 2 do? You manually Rename the GLK file extension to JPG. Please see the post above clearly and follow as i Say. Hi have u tried copying the slm files to sd card and scanning for lost files method? My SLM post has been updated. Please search for slm in this website and go through post. Hav u read the post. What all u tried and failed… Please update on this. i was uninstall application so how can i recover my images and video? Hey buddy I just wanna know how to retrieve all the pictures. Let me explain I just copied all the files and folders into my computer from my android phone. I had gallery lock application installed locked with 400+ pictures in it. I copied back all the folders and tried opening gallery lock which showed just the count of pictures and none of them could open. Please help me recover… I could see the file extensions in ( /sdcard/android/data/com.sec.android.gallery3dcache/imgcacheMicro.0 ). the file seems to be 100mb. What is the Image file extension? I have deleted the all of my photos in da gallery look app by mistake so can u plz help me out to recover all my photos..
Hey buddy I just wanna know how to retrieve all the pictures. Let me explain I just copied all the files and folders into my computer from my android phone. I had gallery lock application installed locked with 400+ pictures in it. I copied back all the folders and tried opening gallery lock which showed just the count of pictures and none of them could open. Please help me recover.